Looks like Continental has decided to start charging $15 for the first checked bag at the same time they work on devaluing their frequent flier program. Yep, they’ve got some bad news for everyone in this round of changes. The tersely worded statement released by the airline was released on Friday morning, and it leaves a lot to be desired. For an airline that has been gaining an increasing reputation for a premium product, this seems to fly in the face of what they’re trying to do. The statement itself was odd in that it had no quotes from senior management and made no effort to try and offer a rationale. I suppose this isn’t surprising because it’s harder to explain in the face of declining oil prices (down below $108 last I checked). So why would they do this now? Maybe those fall revenue forecasts are coming in lighter than they thought, so they’re trying to boost them up quickly. Then again, there are so many holes, it’s not going to have as great an impact as they might want. Full fare coach, military, and elite members don’t have to pay. But don’t worry, those elite members have far more to be angry about. Continental is eliminating its 500 mile minimum accrual per flight. You’ll now get actual miles flown. But even more likely to bother the best customers than that is the reduction in bonus miles earned. Silver elites will now get a 25% bonus over actual miles flown instead of a 50% bonus. And Platinum elites will get 100% instead of 25%, matching the Gold elite bonus which remains unchanged. This change makes some sense. The levels were previously aligned with Northwest’s levels, and now these new ones will match United. While both of these make some sense, taking away a perk always angers people, and these are Continental’s best customers. For Continental to do something like this is surprising. It leaves Delta as the lone holdout from the first bag fee among legacy carriers. At NBTA, Delta CEO Richard Anderson made it clear that they thought one free bag was a fair deal and that they were committed to it. True, they charge $50 for the second bag, $25 more than everyone else, but that probably doesn’t make them nearly as much as a first bag fee would. So we now have Northwest and US Airways which have made it clear they want to be at the bottom of the food chain. American and United are sitting in the confused middle, lacking a consistent message. Continental and Delta are at the top, but Continental seems to be making some ill-advised changes that put their strategy in question, to some extent. Will Delta follow? Or will they continue to stand by their promise to offer a premium coach experience? Will Continental continue to devalue its offering? As you may have seen, we announced a $15 fee for the first checked bag for certain customers earlier today. While it’s not our preference to do so, given the current environment, we are losing our competitive stance with other carriers. We had hoped that we would see more customers choosing Continental with other airlines charging for the first bag, but we didn’t see that happen, so we think this is the right thing to do for Continental. 18 Responses to Continental Adds the First Bag Fee; Is Delta Next? Remember that Continental is heading to the Star Alliance. With that in mind it looks like Continental is trying to mirror its new Alliance partners. I’d expect to see a Segment counter added to their program soon as well, that way short hop flights would still count toward status as they do on United and US Airways. I wonder what the fee situation will be at Delta after the merger. CO already has a segment counter…elite qualification points…so frequent short haul customers are covered for elite qualification…the negative perception is likely worse than the actual benefit reduction. CO’s savings will come in reduced award liability and in years to come that will be worth the short-term negative impact of this message. “Continental is trying to mirror its new Alliance partners”? Well since most of Continental’s partners are outside the U.S. and haven’t instituted anything quite like the changes going on in the U.S., I am not quite sure this is true. DRG – Continental’s new US partners do have this policy, so by doing this they present a unified Star Alliance policy among the US carriers. I think Keller’s argument is a bit weak. He argues that they were hoping they’d see an increase in bookings as it maintained the Free First Bag. But, they didn’t see this increase so they raced to the bottom with everyone else. If this was really what they were watching, how much data could they have collected? 1 month of August bookings. Since many close-in travelers are exempt to this fee on all carriers, you really need to watch long lead travel build, and I’m thinking that most of that build will start to happen after Labor Day. So, although it sounds good, I’m not sure it is very genuine. This really annoys me as I continually promote CO to my clients as the best of the bunch. 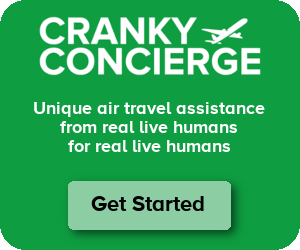 I was hoping they’d continue to differentiate themselves by offering the best product without mirroring the fees being charged by US Airways and NWA. Why can’t the carriers all just add a flat $25 surcharge and be done with it, this nickel and diming mentality is not winning over any customers…in fact, I’ll stick to Southwest when it comes to short haul west coast flights as they seem to be the only ones committed to the no baggage fee at this point–and they still give you water and non-alcoholic drinks for free!! Well.. the frequent flyer programs were all designed to promote customer loyalty. We all know that is a completely moot issue now. I take whatever airline can get me there nonstop or through a connection city that ISN’T ORD in the winter, or PHL or EWR EVER! That means that I will fly AA thru DFW or CO through IAH. So why should they give me more? The upgrades are essentially useless when CO flies 737s that have 8 First class seats. (I get more upgrades from NW on my CO FFQ number). As for local news, YX is essentially going away. They will own 9 717s. That’s not many planes and they will run them all the time. No flex for mechanicals, no planes “in the hanger.” The good news is that the Republic EJR 170s are very comfortable airplanes!! I love them. When you compare the cabin width of a CRJ and an ERJ 170 (both with 4 seats across) its obvious. So GOOD news in that regard. No more ridiculous decisions on “Midwest Class” and two seating arrangements, and yada yada yada. The other bad news is that we business travelers cannot book fall travel reliably because YX hasn’t quite decided what it will do. Another comment I thought of – if CO is saying customers didn’t really choose them because of the lack of a first bag fee, I wonder what SW is seeing with its strategy. Hard to walk away from the revenue that comes from charging $15 for a first bag, especially if there is no noticeable upside to stealing bookings away from your competitors who have been charging the fee. Also wanted to mention that WN saw a 5 LF point decline in August traffic – I don’t know why, but I can only hope for WN that RASM hasn’t seen a similar decline, which would mean that yield was the name of the gate for August. Certainly the folks that were in charge of the NO FEES marketing campaign are a little confused and find their campaign success hard to quantify! 1) In flying any kind of weight and space is a product. Although so far we’ve been used to getting some weight complimentary it is definitely not free to the product providers, the airlines. I had a short connection with United in OHR on Thursday and then to LGH. Baggage did not arrive. I ended up flying to PRN the next day with another airline. United had to fly my luggage to PRN for me with another airline. I ended up not paying for my second luggage because United couldn’t place it on my last flight segment. Imagine the expenses there just because of that short connection in OHR. Imagine the reduction in junk flying around when people actually have to pay for it. 2) Enough with trumpeting Southwest as the airline not charging fees. They can only afford that because: a.) they have minimal connecting passengers b.) they do short hops where not much luggage is loaded on the belly. Even if LUV wins some passengers with this policy, it is going to increase its costs and ruin its no-frill and quick turnaround model. $15 is a reasonable fee to prevent abuse and overloading of the system with not much extra utility. If it’s integrated seamlessly in the ticketing system, I say go for it. This fee is a great inducer for the people to think about carrying that extra luggage. And if they don’t want to be nickel and dimed, let them upgrade to the clubs and pay the good old prices and allow us poor people to do the flying in the cheapest way possible by paying only for the services we personally use. Anybody remember when banks used to charge money to cash a check? They don’t anymore, but they get you in other more hidden fees. We’re seeing the same process in the airline business. I’m not sure that there is anything wrong with it though because that’s where the customers are heading. Full service is a good thing as long as anyone will buy it. Right now that seems to be the case with some airlines in Europe and Asia, but not in the land of Walmart and Costco. :) Sorry, still recovering. OHR should have been ORD and LGH should have been LHR. Much more palatable but 48 hours nevertheless. i just flew CO a few days a go, but i had to whatch the bags because the rule was 50 kilos in each bag, whith a limit of 2 bags each person. im glad i missed the fee. Nooo! Say it isn’t so. I’ve been out of the loop traveling. I just got back from a trip on AA. I sucked up the bag fee the first flight then upgraded on the return flight (free bags). I was so happy to be flying CO next month, and I was looking forward to free bags and an upgrade. Doesn’t look like either now. Pingback: The Cranky Flier » Why Did Continental Reinstate the 500 Mile Minimum Earning for Elites?